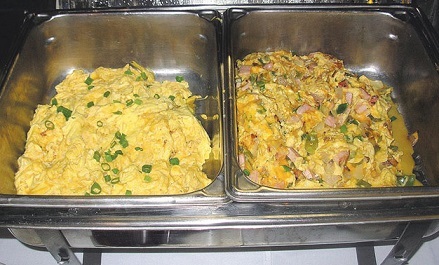 Got a group coming for breakfast or brunch and need to serve Scrambled Eggs? Here is how to cook and hold the eggs so they are still hot and delicious when it’s time to serve. Scrambling eggs shouldn't be a problem. The truth is that doing so is easy. This recipe explains how to scramble the eggs and hold them so they'll be as tasty as if you dished them up right out of the skillet. But they are also easy to ruin because we sometimes make things harder than they need to be. 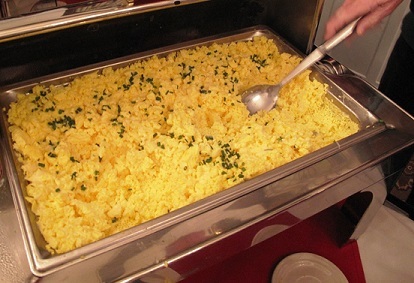 Some people have found ways to make scrambling eggs more complex than what the job requires. 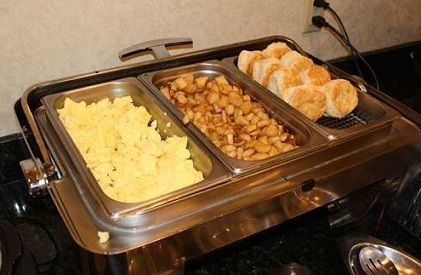 But to hold the eggs hot when serving buffet-style can be a little bit of a problem unless you use a chafer or double boiler. That's the only "secret" to accomplishing the task. Enjoy your eggs and the company of those you share them with!